As with all our surplus items we recommend that you wash the items before use!! ...army surplus bag. Almost everyone has one or had one. With good reason. : they work. Warm (3+ season? ), strong , roomy for the taller person. Hooded, ventral 1/2 length zip, internal pockets, synthetic fill. 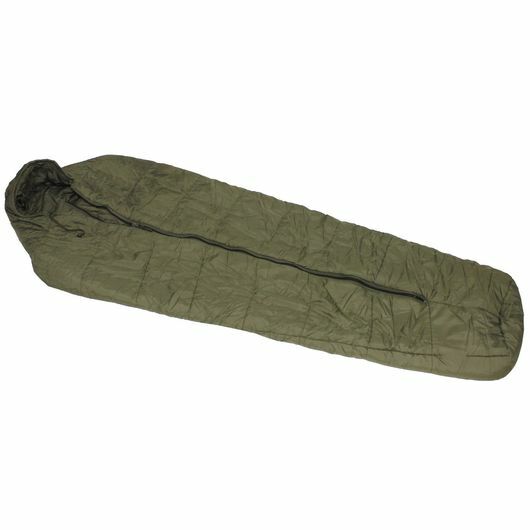 Get a cotton liner and a bivvy bag and it will take anything, probably 4 season use by then?. Ooooh and a compression bag to pull it down to a packable size, because it's not the lightest or smallest bag out there. Effective and recommended.